Main Street east from Skinner Boulevard in Dunedin constitutes a busy commercial arterial to Countryside and Westfield Countryside Mall in Clearwater. Advancing east through the city of Clearwater, SR 580 shifts northward to the city of Safety Harbor and a four-lane bridge across the waters of Safety Harbor toward Oldsmar. 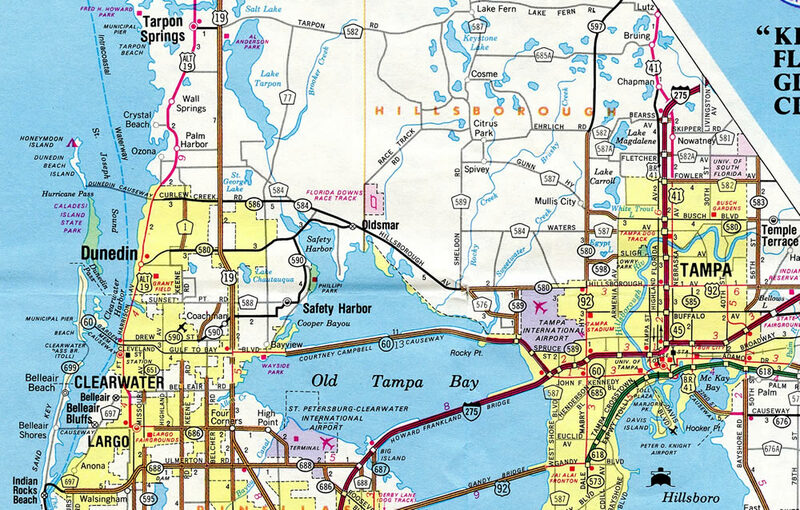 The 1989 Florida Official Highway Map shows the original alignment of Florida 580 through both Downtown Dunedin and through Oldsmar. Note also that Florida 589 ended at Florida 580 by Tampa International Airport (TPA). The new State Street alignment through Oldsmar displaced a quarter mile portion of SR 584, which SR 580 overtakes along Tampa Road to the Hillsborough County line. SR 580 then angles southeast along Hillsborough Avenue amid a mixture of wetlands near Double Branch Bay and developed areas of unincorporated Countryway. The arterial becomes increasingly busy with six overall lanes to Town &apos;N Country, an older suburban area west of Tampa. This stretch was constructed by the 1950s to replace Memorial Highway as the route of SR 580 between the county line and Sheldon Road. A diamond interchange joins SR 580 (Hillsborough Avenue) with SR 589 (Veterans Expressway) on the northwest side of Tampa International Airport (TPA). This stretch of SR 580 is regularly congested with commuters during peak hours as it links the Veterans Expressway with Dale Mabry Highway (U.S. 92) at Drew Park. A parclo interchange handles the movements there, where SR 580 turns north onto Dale Mabry Highway. Dale Mabry Highway represents the main arterial route between Tampa and the northern suburbs. 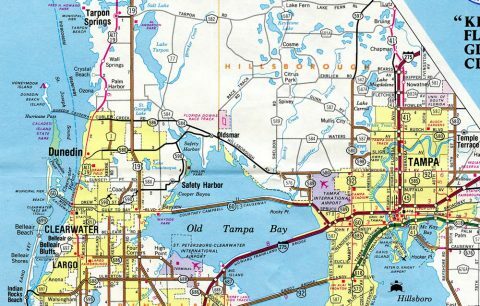 The arterial route originates at MacDill Air Force Base in South Tampa and ends at U.S. 41 in Land O' Lakes, Pasco County. The SR 580 portion totals 2.75 miles between Drew Park and Busch Boulevard in Carrollwood. Resuming an eastward course, Busch Boulevard takes SR 580 from a folded diamond interchange with Gunn and Dale Mabry Highways into the city of Tampa at Armenia Avenue. The state road parallels a CSX Railroad line to an exchange with I-275 and Hillsborough Heights. The four-lane boulevard proceeds from there to Busch Gardens and the Temple Terrace city line at 52nd Street. One quarter mile further, SR 580 ends at SR 583 (North 56th Street) and Bullard Parkway (CR 580). "SR 580 paves way for grand opening." St. Petersburg Times, January 3, 1989. "New road eases traffic in Oldsmar." St. Petersburg Times, October 2, 1997.